When you need to make long straight cuts on the jobsite one of the best ways to do it is with a track saw (or plunge saw), but transporting and using long tracks on the jobsite is not always easy. So wouldn't it be great if you could roll up your track and store it in your tool case? 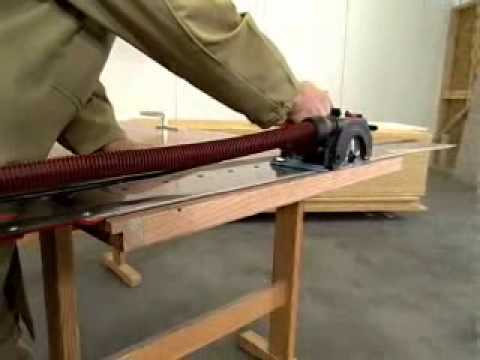 While this does sound impossible, a company called Mafell makes a track saw system that does just that. I first learned about Mafell a few years ago, but my current work on a jobsite has me and my co-workers cutting large panels all day and the Mafell system popped into my head again. The Mafell Flexi-guide rail has a track that is very similar to the kind Festool and many other track saws use, but it is made out of a special metal that is flexible yet ridged enough to deliver straight cuts. The Flexi-guide is so flexible that it can be rolled up to fit inside the carrying case of the KSP 40 Flexistem Track Saw kit, which is actually a Systainer. Sadly, while the Mafell track saw can be used on Festool guide rails, I have heard that Festool saws will not work on Mafell tracks. 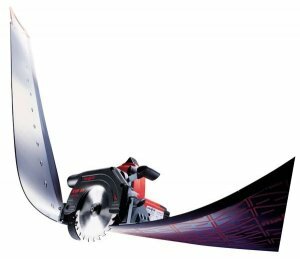 So I guess if you want a more portable track saw system, you need to use a Mafell track saw, which actually look to be quite impressive. Despite being relatively unknown in the US, Mafell saws seem to rival Festool products in features and quality. Sadly like all lesser-known quality made products, Mafell saws have a large price. Their KSP 40 Flexistem Kit includes a small 4-3/4" track saw and a 1400mm(55") Flexi-guide rail for the price of about $680. Though the saw is small, it has a cutting depth of 1-9/16" on-rail. They do have saws with greater cutting depth, but something similar to a Festool will start at about $770 for just the saw. So I guess if you want to show up your Festool friends, you get a Mafell.